In recent years, a number of leading security studies scholars including Christopher Layne, John Mearsheimer, Robert Pape, Barry Posen, and Stephen Walt have come out in favor of U.S. strategic retrenchment overseas. The fact that this list of scholars reads like an honor roll of prominent academic realists makes the current trend all the more interesting. ‘Offshore realism’ would seem to be the order of the day. This trend, moreover, is hardly limited to the academy. The case for strategic retrenchment and offshore balancing fits with large sections of popular and congressional opinion, tired as American citizens and politicians they are of foreign wars and given that they are consumed with domestic economic difficulties. Indeed, it could be argued that the Obama administration is implementing a modest form of strategic retrenchment which will only accelerate in the next few years. Stephen Brooks, John Ikenberry and William Wohlforth. “Don’t Come Home, America: The Case against Retrenchment.” International Security, Vol.37, No. 3 (Winter 2012/2013): 7-51. In their 2012/13 International Security article “Don’t Come Home, America,” Stephen Brooks, John Ikenberry and William Wohlforth push back against arguments for offshore realism. They begin, very usefully, by delineating the opposing case in some detail. Offshore realists argue that the U.S. should “curtail or eliminate its overseas military presence, eliminate or drastically reduce its global security commitments, and minimize or eschew its efforts to foster and lead the liberal international order” (7). These arguments typically rest upon the claim that existing strategic commitments abroad impose unacceptably high costs upon the United States, for example through current levels of defense spending; trigger profound resentment, resistance, and counterbalancing on the part of other states; encourage free riding on the part of U.S. allies; entrap the U.S. in unnecessary conflicts; and tempt American policymakers to define U.S. security interests much too broadly; all of which creates conditions of “imperial overstretch” and actually accelerates America’s economic decline relative to other states. Brooks, Ikenberry and Wohlforth then proceed systematically to rebut each of the above claims. They point out that offshore realists typically suggest that a strategy of retrenchment would save the United States a great deal of money, but the details about the extent of the retrenchment and the specific budgetary savings are often unclear. A modest form of retrenchment would not necessarily amount to much in savings for a fifteen trillion dollar economy, while a deep form of retrenchment might very well cost the United States much more than it saved, over the long run. If the United States were to dismantle most of its overseas military presence, and then have to rebuild it for any reason, this would amount to a very expensive strategic experiment costing much more than the current strategy does. Similar problems surround claims of anti-American counterbalancing. As a matter of fact, none of the world’s leading powers, including Russia or China, are forming traditional military alliances against the United States. Warnings of counterbalancing have therefore been reduced to claims of extant “soft balancing,” by which other states express displeasure or highlight international norms in an attempt to deny U.S. behavior legitimacy. But as the authors of this article point out, by that standard, the United States is the greatest soft balancer on the planet, so that sort of activity goes both ways. On close investigation, it is far from obvious that America’s global alliance system weakens the United States. Security commitments to U.S. allies do not exactly encourage free riding, because strictly speaking, these commitments are not collective goods. Washington can and does exclude any state that it likes from an array of security guarantees, thus reducing the relative security of that state. American policymakers are well aware of the risks of entrapment, and deliberately design their security commitments to minimize these risks while asserting leverage over U.S. allies. Most of the causes of slow U.S. economic growth have little to do with its international security policies, and current American defense spending is not especially high or burdensome by historic standards (18). Finally, the reliance of so many other states on U.S. security guarantees means that those states tend not to invest in significant military modernization, which in turn only serves to entrench American military dominance. The authors use Joseph Nye’s phrase, “deep engagement,” to describe America’s overarching international security presence since World War Two. One of the great virtues of this article is that it helps clarify the distinction between support for deep engagement and support for the initial 2003 invasion of Iraq. . As Brooks, Ikenberry, and Wohlforth point out, for Americans to abandon this overall set of security commitments because of the tragedy of Iraq would in all likelihood be a terrible mistake. Deep engagement by the U.S. overseas, including its broad alliance system and its military preponderance at the global level, has provided an historically unprecedented set of benefits both to the United States and to the world as a whole. It reassures U.S. partners, deters possible aggressors, and dampens regional security competitions. It keeps global sea-lanes open and undergirds a relatively liberal economic order internationally in which the U.S. dollar remains the world’s reserve currency. There is no reason to expect that these benefits would continue in the absence of America’s overarching presence. A less convincing section of the article is the one on the institutional benefits of America’s deep engagement abroad. 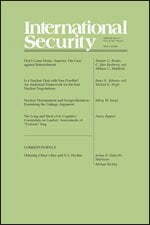 The authors argue that “states often can benefit from institutionalized cooperation,” that “transnational threats can be realistically addressed only through various types of collective action,” and they note that “we are aware of no serious studies suggesting that U.S. interests would be better advanced in a world that is closed (i.e. built around blocs and spheres of influence) and devoid of basic, agreed-upon rules and institutions” (46-47). No doubt, there are many instances in which the United States benefits in concrete ways from institutionalized cooperation with specific U.S. allies, and the authors offer examples of this in the article. But assertions as to whether institutional and multilateral cooperation serves U.S. interests can only be judged on a case by case basis. The United States is not obliged to support every case of multilateral cooperation or treaty-making simply because it is multilateral. Nor is it really accurate to suggest that multilateral action is always indispensible or even preferable. To take one example, in the spring of 2011 President Obama authorized a Special Operations raid against the suspected compound of Usama Bin Laden, unilaterally, on the territory of a nominal U.S. ally, Pakistan, and without that ally’s knowledge or permission. The President did so because he suspected, quite rightly, that informing the Pakistanis ahead of time might have endangered the success of the mission. It can hardly be said that a more multilateral approach would have better served American interests. This goes to the question of whether multilateral techniques possess the superior, sweeping effects that are often claimed for them. Offshore realists like John Mearsheimer do not suggest that the U.S. would be better off in a closed, lawless world. They do however argue that international institutions are mainly arenas for competing national interests, rather than major causes of cooperation in their own right. And on this particular point, it must be conceded that Mearsheimer and other offshore realists have quite a strong case.. The authors also do not really consider the possibility that major strategic retrenchment has already begun under the Obama administration. They simply suggest, very briefly, that projected levels of defense spending are adequate, and that Obama’s evident determination to exit Afghanistan and pivot toward Asia are exactly what one would expect from a realistic strategist committed to upholding America’s deep engagement overseas. To be sure, Obama has not gone nearly as far as many of the offshore realists would like in curtailing U.S. strategic commitments abroad. But the argument that downward sloping defense expenditures are enough to secure existing objectives is not exactly uncontroversial. How does one, for example, pivot energetically toward the Asia-Pacific, while simultaneously cutting the U.S. Navy? And what evidence is there that the U.S. will be able to help stave off the Taliban and its Al Qaeda allies in Afghanistan once American combat forces have exited that country? As the authors note, Obama seems to have adopted an approach toward leading security challenges overseas that relies mainly on drone strikes, intelligence, and special operations rather than a substantial troop presence on the ground. In the wake of years of warfare in Iraq and Afghanistan, the domestic political appeal of such an approach is obvious and understandable. But such light-footed approaches have also been tried before in American history, and their record of success is mixed to say the least. A strategy of offshore realism is often mistaken these days for being the only kind of foreign policy realism available. One of the multiple contributions of this excellent article is to show that such is not the case. The central arguments of “Don’t Come Home, America” are based largely, though certainly not exclusively, on realist assumptions about the nature of international relations. Yet the authors demonstrate persuasively that there is a strong case to be made, from a realist point of view, for rejecting U.S. strategic disengagement. A traditional realist insight has been that the United States oscillates between periods of idealistic overconfidence and disillusioned withdrawal, leaving it unprepared for the next set of challenges. It is quite clear that the U.S. entered into Iraq with excessive confidence. But that was a decade ago, and a great deal has happened since then. We now appear to be well into the traditional down cycle during which Americans grow fed up with international commitments. The coming question is not whether the United States should embark on some great new foreign adventure – it is whether it should dismantle the broad set of security commitments inherited from the past seventy years. As the authors of this article convincingly suggest, the answer to that question must surely be no. Colin Dueck is an Associate Professor in George Mason University’s Department of Public and International Affairs. He is the author of Hard Line: The Republican Party and U.S. Foreign Policy since World War II (Princeton, 2010), and Reluctant Crusaders: Power, Culture, and Change in American Grand Strategy (Princeton, 2006). See Christopher Layne, “From Preponderance to Off-shore Balancing: America’s Future Grand Strategy,” International Security, Vol.22, No. 1 (Summer 1997), pp. 86-124; John Mearsheimer, “Imperial by Design,” National Interest, No. 111 (January/February 2011), pp. 16-34; Robert Pape, “Empire Falls,” National Interest, No.99 (January/February 2009), pp. 21-34; Barry Posen, “Pull Back: The Case for a Less Activist Foreign Policy,” Foreign Affairs, Vol.92, No.1 (January/February 2013), pp. 116-130; and Stephen Walt, Taming American Power: The Global Response to U.S. Primacy (New York: W.W. Norton, 2006).